Alexander Zemlinsky (October 14, 1871  March 15, 1942) was one of the most powerful musical voices of his time. A remarkably influential musician, he had connections with both the more traditional and the Second Viennese School. Although his work was nearly forgotten after the war, he has recently been recognized as one of the 20th century's significant compositional voices. 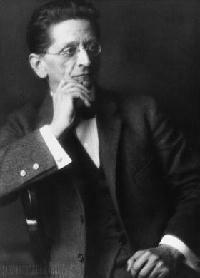 Alexander Zemlinsky, composer and conductor, was born in Vienna to a Slovakian Catholic father and mother of mixed Sephardic JewishMuslim descent. He played piano and organ from a young age and was admitted to the Vienna Conservatory in 1884 to study piano and composition under Anton Door, Franz Krenn, and the brothers Robert and Johann Nepomuk Fuchs. Zemlinsky's first chamber compositions were performed in 1893 at the Wiener Tonkünstlerverein, where he appeared as guest pianist and conductor. , conducted by Gustav Mahler at the Vienna Hofoper in 1900. Shortly thereafter, Zemlinsky became romantically involved with Mahler's pupil Alma Schindler. Pressure from friends and family, however, influenced Schindler to reject Zemlinsky in favor of Mahler himself. Zemlinsky married Ida Guttmann in 1907; following her death in 1929, Zemlinsky married Louise Sachsel, a former student twentynine years his junior. Until 1903 Zemlinsky had been Kapellmeister at both operetta houses, Carltheater and Theater an der Wien. Although Zemlinsky also taught regularly at the Schwarzwald school, he was forced to seek further employment with the early death of his father. In 1904 Zemlinsky and Schoenberg founded the Vereinigung Schaffender Tonkünstler, with support from Mahler, to promote contemporary music in Vienna. At this time Zemlinsky was appointed first Kapellmeister at the Volksoper, before departing briefly to join Mahler at the more prestigious Hofoper. However, when Mahler resigned, his contract was not extended, and Zemlinsky returned to the Volksoper. Zemlinsky received acclaim in 1910 with the premiere of his own Kleider machen Leute, subsequently accepting the musical directorship of the Neues Deutsches Theater in Prague. It was under his direction that the Prague theater gained admiration as one of the most esteemed opera houses in Europe. His assistants included Kleiber (191112), Webern (191718) and Szell (191920), and Viktor Ullmann served as chorus master (19217). In addition to conducting, Zemlinsky's finest works were composed during this time, including the Maeterlinck songs, the Second Quartet, the Lyrische Symphonie, Eine florentinische Tragoedie and Der Zwerg. Zemlinsky had successfully secured the future of the Prague theater, renamed the Deutsches Landestheater with the founding of the Czech Republic in 1918. He was appointed rector of the Deutsche Akademie für Musik und Bildende Kunst, where he associated with Schoenberg's pupils Anton Webern, Heinrich Jalowetz, Karl Horowitz and composer Hans Krása. In 1923 he became a guest conductor for the Czech Philharmonic Orchestra, launching the orchestra's affinity for Mahler as well as conducting notable premieres of Czech music, including works of Bedřich Smetana, Leo Janáček and Josef Suk. In 1924 Zemlinsky conducted the world premiere of Schoenberg's Erwartung at the Prague ISCM Festival, though relations with his brotherinlaw had begun to deteriorate for personal and professional reasons (apparently a disagreement that stemmed from contradictory views on the technique of 12note composition). Although Zemlinsky was an important musical figure in Prague from 1911 to 1927, he nonetheless made several unsuccessful attempts to either return to Vienna or continue his work in Germany. In 1923 Max von Schillings offered him the post of Generalmusikdirector at the Staatsoper in Berlin. Zemlinsky refused the position, but reluctantly accepted an offer at the Kroll Oper with the promotion of a new Kapellmeister, Hans Wilhelm Steinberg, in Prague. He remained in Berlin until the closing of the theater in 1931, subsequently teaching at the Musikhochschule and guest conducting throughout Europe. Although Zemlinsky received praise for conducting the Berlin production of Kurt Weill's The Rise and Fall of the City of Mahagonny that year, and later for setting Klabund's (pseudonym of Alfred Henschke) Kreidekreis in 1932, he soon returned to Vienna with new focus on his own compositions. After completing the score for Der König Kandaules in 1936, Zemlinsky was required to abandon its orchestration because of the Anschluss in March 1938. He fled first to Prague and afterwards to New York City with his wife and daughter. Once in New York City, Zemlinsky hoped to perform Kandaules at the Metropolitan Opera, but the libretto was considered inadequate. He was forced to forsake these larger works and direct attention to smaller compositions for financial reasons. In 1939 Zemlinsky attempted a final opera, Circe, but it remained incomplete after the composer suffered a series of strokes. Memorable moments of his final years include a brief reconciliation with Schoenberg and a national NBC broadcast of his Sinfonietta in 1940 under the direction of conductor Dimitri Mitropoulos. Zemlinsky's compositions are recognized for bridging the gap between late Romanticism and twentiethcentury modernist styles. Following the path of teachers Robert and J.N. Fuchs, and also Brahms and Wagner, Zemlinsky notably developed shifting tonal centers within a formal technique of variation and wordpainting in the style of Viennese expressionism. The influence of Brahms is apparent in Zemlinsky's early works, while later works draw from Mahler and the extended harmonies of Wagner. Zemlinsky eventually explored symbolism, but unlike his colleague Schoenberg, avoided extreme dissonance, twelvetone technique and atonal music in general. Although these compositions reflect an affinity with Berg, who sought rational solutions to structural problems, Zemlinsky embraced asymmetry and did not seek such solutions. Zemlinksy's earlier works, Sarema and Es war einmal, reveal a characteristic Brahmsian form, dramatic pacing and nervous intensity also observed later in his First Quartet and Clarinet Trio. He departs suddenly from these Romantic characteristics in Die Seejungfrau, a work composed during his tumultuous affair with Alma Schindler, who appears indirectly as the princess and outcast in the subsequent Der Traumgörge, often considered one of Zemlinsky's finest works. Zemlinsky was admired not only for his compositions, but also for his conducting. Kurt Weill and Stravinsky, among others, praised him for his notable interpretations of Mozart and for his advocacy of Mahler, Schoenberg and contemporary music in general. Zemlinsky's work vanished from concert and opera programs until the late 1960's, when his music was revived in the wake of widespread Mahler zeal. The Fourth Quartet and Psalm XIII, neither of which had been published or performed during his lifetime, were rediscovered and celebrated posthumously. In 1907 Der Traumgörge was scheduled for a performance by Mahler, but was cancelled by Felix Weingartner, and postponed until its world premiere in 1980.